Thought about travelling without luggage? Send My Bag ships your luggage to and from your destination so you can travel light. It means you can avoid the hassle of excess baggage fees and the stress of dragging suitcases behind you onto public transport. Find out just how affordable it is to travel with little more than a handbag. One piece of baggage weighing no more than 11 lbs/ 5 kg and not exceeding maximum total dimensions of 45 in/ 115 cm. Passengers travelling on First Class fares may bring two items of carry-on luggage into the cabin. Baby food/ milk and other infant items may be brought on board when travelling with an infant, in addition to standard cabin baggage. A coat, umbrella, camera, binoculars, reading materials, baby basket, crutches, folding wheelchair. Economy and Premium Economy: 2 bags x 50 lbs/ 23 kg each. Business: 2 x 70 lbs/ 32 kg, First: 3 x 70 lbs/ 32 kg. Infants: 1x 22 lbs/ 10 kg. The total dimensions of each bag must not exceed 62 in/158 cm. This is the allowance for flights involving Japan, America, Oceania, Russia, Dubai and Nairobi or originating from Singapore to Mainland China. 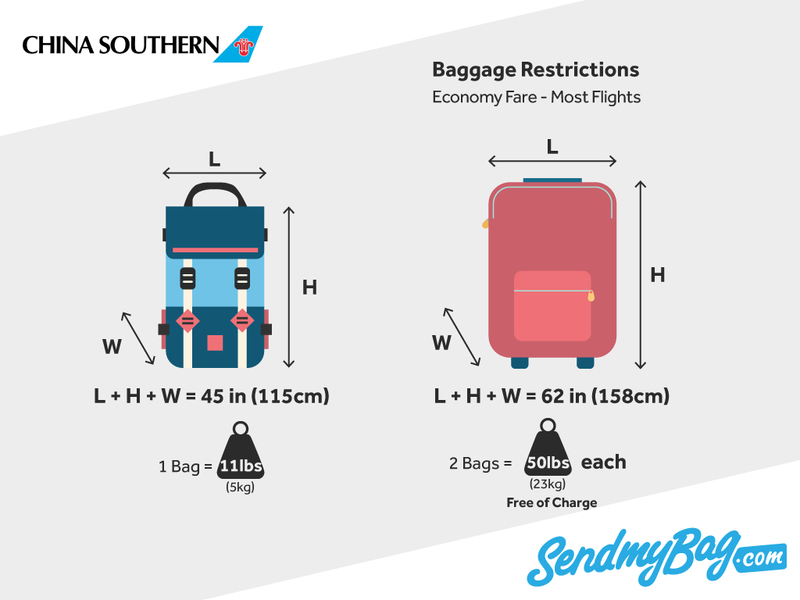 On flights involving Middle/ West Asia routes, Economy/ Premium Economy is permitted 1 bag not exceeding 70 lbs/ 32 kg. 1 bag not exceeding 22 lbs/ 10 kg for infants. Within China the allowance is 44 lbs/ 20 kg for Economy/ Premium Economy, 66 lbs/ 30 kg for Business, 88 lbs/ 40 kg for First Class, and 22 lbs/ 10 kg for infants. An infant without a seat is entitled to a free baggage allowance of 22 lbs/ 10 kg. On routes operating a piece-concept baggage allowance, the 22 lb-piece must not exceed 45.27 in/ 115cm in total dimensions. You may also check a buggy or child's seat for your infant. Excess baggage fees will be charged if a passenger exceeds the baggage allowance included in their fare. The cost of one additional bag is CNY1000, and CNY2000 for any further additional bags. An oversized bag incurs a fee of CNY1000. An overweight bag between 50 lbs/ 23 kg and 70 lbs/ 32 kg is CNY1000, and an overweight bag between 70 lbs/ 32 kg and 99 lbs/ 45 kg costs CNY3000. Looking for China Southern sized hand luggage?